CLIENT PORTAL Email: Password: Forgot Password? 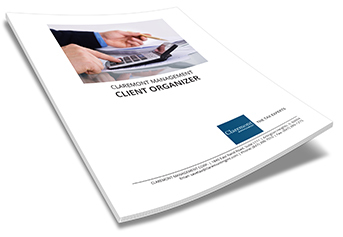 *Existing Claremont Management clients receive a personalized version of this organizer annually. In addition to our full range of accounting services, Claremont also offers management consulting services. Using our financial and analytical expertise, we can help your company or organization make informed financial decisions. Our goal is always to help our clients achieve growth and profitability through better financial insight. Claremont Management Corp. is an accounting and tax preparation service based in Arlington Heights, IL. We welcome new clients and offer competitive rates. Give us a call today at (847) 398-7010 or submit the form below to schedule your free consultation. Claremont Management's free email newsletter provides valuable tax-related news and other information and updates. Rest assured, we won't share your email address and you can easily "opt-out" anytime. © Copyright 2019 by Claremont Management Corp. All Rights Reserved.